It's time to SPARK some kreativity. The Kraaft Shaak design team members were each gifted a mixed-media kit from the Kraaft Shaak store to use. You can find out about all the projects and other fantastic designers HERE. I love this kit so much and have already written a long post about it. I couldn't help myself. 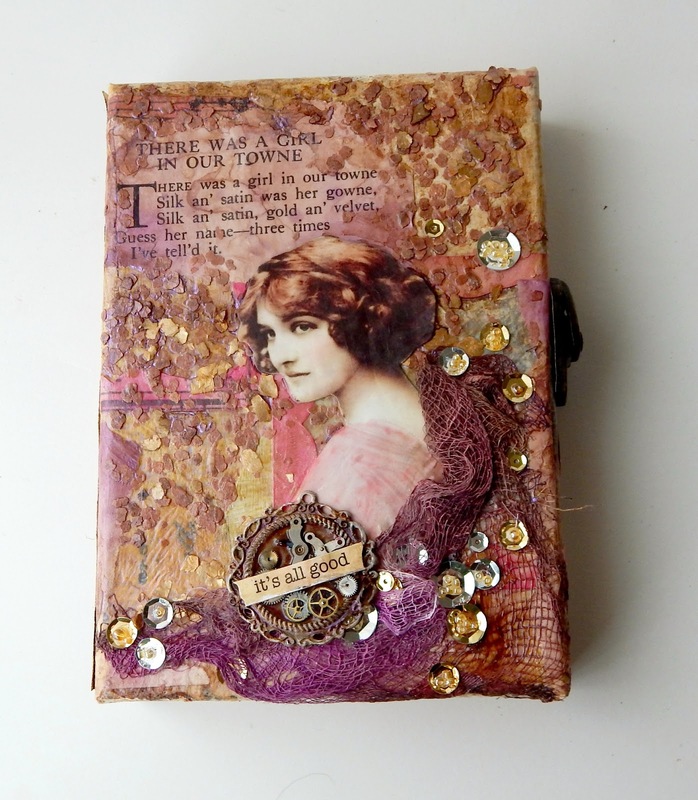 There were just so many good things that I had to tell you about, you might want to also check out my post Mixed Media Art Kit Adventures. I got a kit with two 5 x 7 canvas's and picked Eggshell Prima Chalkboard Paint and the White Sand Texture Paste. 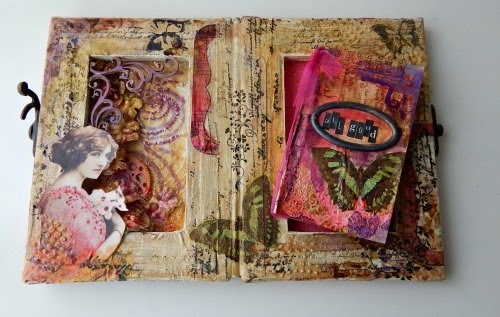 The Mixed media kit was my "Spark" for Kreativity for this project. I'm kinda of a "seat of my pants" krafter, trying new things and learning as I go. I decided to use both my canvas's (should I say, kan-vas?) in one project, stack them together and make a book. I got a little too excited about all my great ideas that I forgot to take good photos of all the cool stuff in the kit. ARG. Note to self - grab a camera like +Sylvia Tabor does whenever I open a box. It drives me nutty when folks don't share all the good stuff they get in the mail - but what do I do when I get good stuff? I tear right into it like a kid on Christmas. Little Samples of fun things that go a looong way. 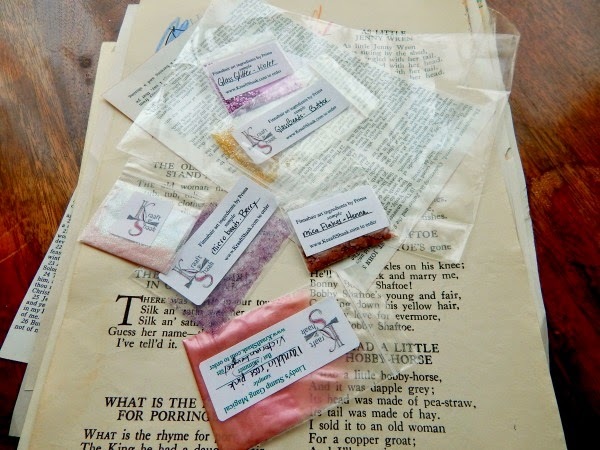 This is Art Sugar, Micro Beads, Lindy's Stamp Gang Magicals, Mica Flakes, Butter Beads, Glass sitter, and Sample Collage Papers from the Kit. These are some of the collage papers and the selection of all the mediums I got to play with. 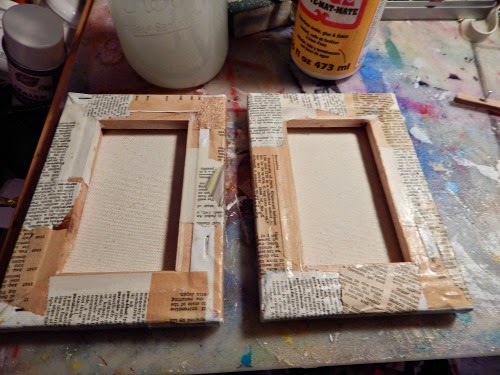 I used the papers for the base of the project and glued them down with Mod Podge, painted them with a couple of coats of chalk paint, and then added some of my own Lindy's Stamp Gang Moon Shadow Colors as well of some Prima Color Bloom Sprays. I didn't have trouble with color layers sticking BUT I also used the Mod Podge and Aleene's spray sealer between some of the layers. 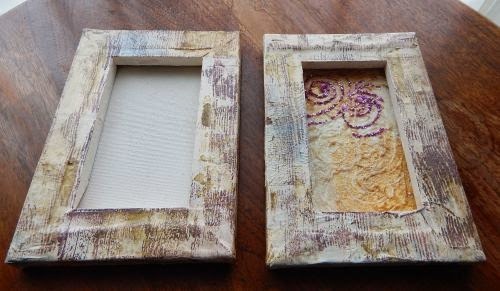 I got a little Finnibair wood grain stamp in my kit that I used on the inside of the canvas. 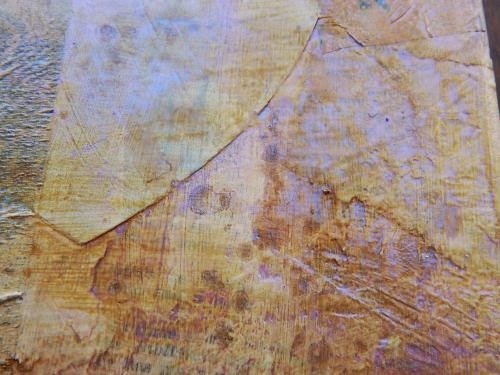 I also added some gold Pearl Ex to the texture paste and spread that on the inside of the one of the 5 x 7's. And did some fun swirls with some the kit goodies. I thought the sand would be dull, but even plain it had a nice kind of gloss that I really liked. I love adding layers and depth. And once I got going - well I just kept going. Pulling things from here and there. Taking an hour to look for just that one thing that I needed from my own stash. This project took awhile because I tried to let things air dry. I din't want to rush anything and ruin it. I misted, I daubed, I layered and dripped to my hearts content to get this messy, grungy-pretty look. I bet that you didn't realize that "grungy-pretty" was a thing. Well it totally is! Tell your husband I said so - y'know that guy who usually asks you, "Did you mean to do it that way?" 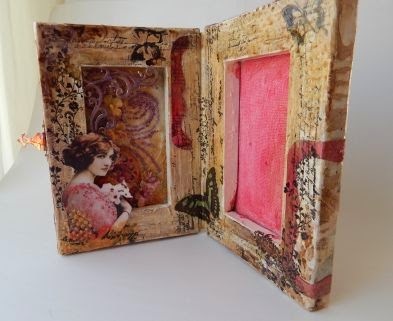 I made the two canvas's into a book just adding gaffers tape down the one side and on the insides. I was going to hinge it too, but the hings were too small or in the wrong place or something. They kept the book from opening nicely so I pulled them out and re-taped it. I worked on the inside of the canvas and the outside. There were die-cuts and a napkin in the kit and I used layered them onto every side of the canvases. 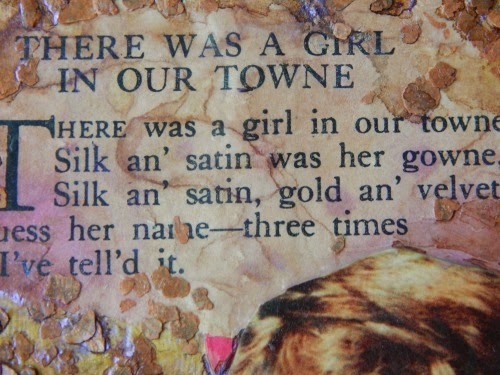 There was a page in the collage papers with rhymes on it from a children's book...as some point and time I decided that I would highlight it. I downloaded the photo of the woman from pinterest that would be my girl in silk and satin. 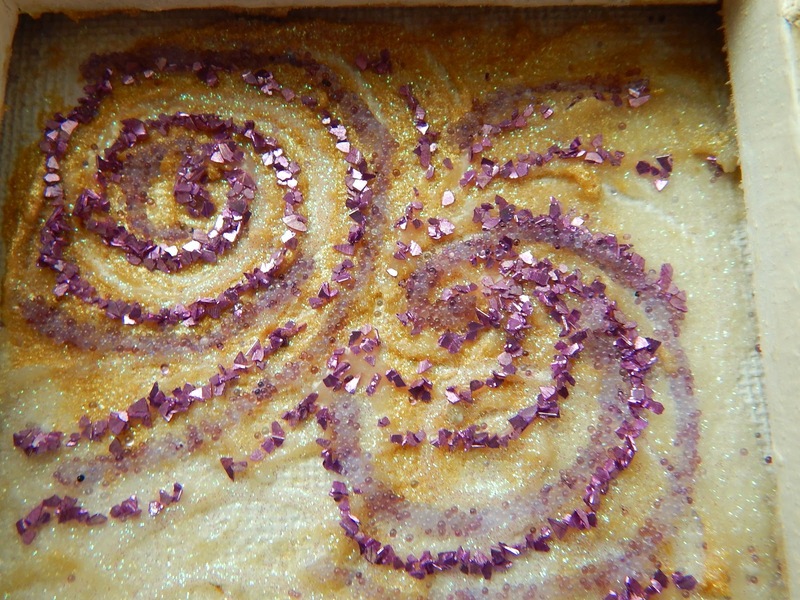 I used the mica flakes from the kit and added a couple of pinches of my own gold flakes. I was hopping for a mosaic effect, or at least something textured like broken china. Be really sweet and tell me that is what you see, and not a bad case of dandruff. I will not go into detail about the little book inside the book. It is my first little book without a simple O ring binding and it didn't go very well. But done is better than perfect. I added a few stickers from my stash, inked the edges and called 'er done. 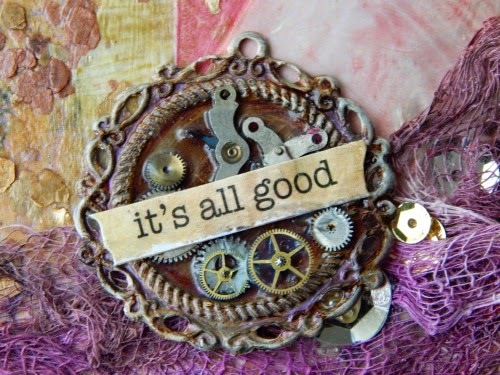 It reads, "All Good." on the cover. I had such fun kreating this. Having the kit really freed me to play with stuff. I didn't worry too much about ruining something precious I just went forward and kreated fearlessly. I hope this little "spark" encourages you to step out of your comfort zone and make something different. And DON'T ask your husband if what you kreate is pretty. Lawd, NO. (not to be hard on our lovely husbands or anything, but some of them are klue-less) Bring it over to the G+ Kraafters Kommunity and share it with us. I promise we will give you some good feedback and answer or find the answers to any Krafty Question you might think up. In fact, if you have any questions about my project, how I did something or what I used, just leave me a comment. I'd love to hear from you. WOW oh WOW!!! I LOVE LOVE LOVE this, Dana!!! Thank you, Sylvia for helping me get past my "moment!" You made my day! To me, art is all about exploring and play. So glad you were fearless and let your muse lead you to create a wonderful project. Loads to look at here. I am going back to enjoy the eye candy. Awww - you called my project 'eye candy!' (GRIN) I'm pretty sure that is one of the highest compliments I have ever received. And Thank You very much Peg, for stopping by to check it out and then sharing it around. Fabulous, you found a way to hinge them! Grungy pretty for sure! 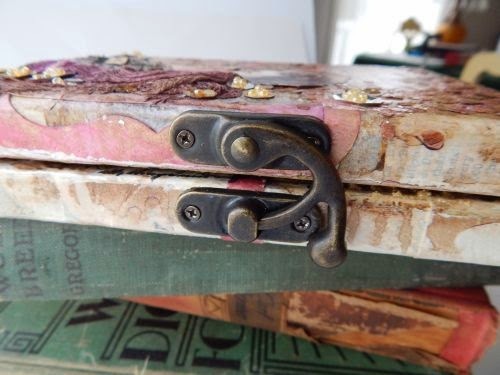 I just used fabric/gaffers tape, which seemed to work well, all though I still think metal hinges would look cooler - or maybe bigger gaffers tape for the binding so that that side looks more like a book? LOL I think I need to go make another one. Thank you for the compliment, Nanette! And for all your helpfulness over in the Kommunity too. How clever! Making a book out of the two canvases genius! Great project. So much to discover I just want to pick it up and look at it with my hands! It was really fun, Sandra! And it gave me room to used a lot of the mixed media kit so that maybe the last challenge will be easier! Although I still do have a lot of the paint and texture paste left! Love it, Dana - what a fabulous treasure, and so RICH! Thank you so much Win-Din! When you say, "Fabulous!" I picture your fantastic party heels - so that is a great compliment to me! Beautifully done! Pinned! Thanks for the inspiration! Anyone can make something like this in any style - if you make one Theresa please let me know, I would love to see it. Thank you so much for the visit! I'm going to have to take some lessons from Sheri at the Shaak on how to make signatures, but - thanks! I wanted there to be something inside that was useful instead of just a double "reverse canvas" kind of thing. 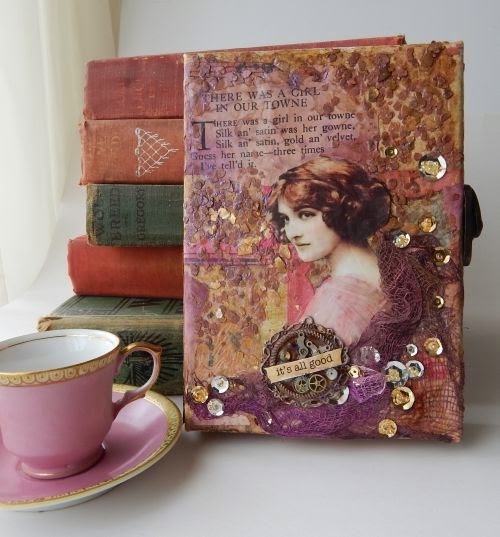 I thought the mini book would make it more of a personalized canvas to use instead of just "Look"
Aino - I wonder how much it would be to send you a little parcel? I bought the closing hinge in bulk - which means I have extra! I can't wait to see where this "Spark" takes you and what you make! Did you make one yet? Did you? I can't wait to see the more modern twist you might put on the idea. Really, one can do anything. I think I need to make another one now! Also...I went to pin your pictures onto my boards...and then got lost in all of your boards for half an hour! Thanks again for all the sparks! Hahahaha! I get lost on Pinterest too Beth! I will look at the time and wonder where the time went. I'm glad you found some interesting stuff on my boards, they are not very well organized, but that task is just so daunting to me! 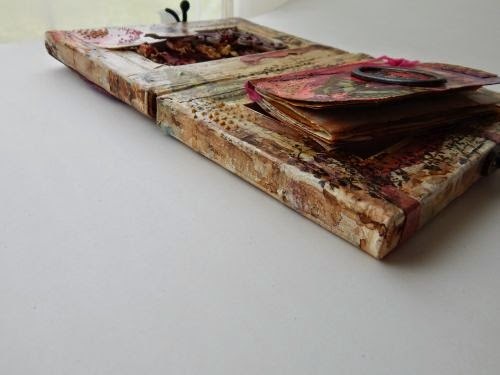 This turned out so pretty, what a clever idea! Clever, Dana! 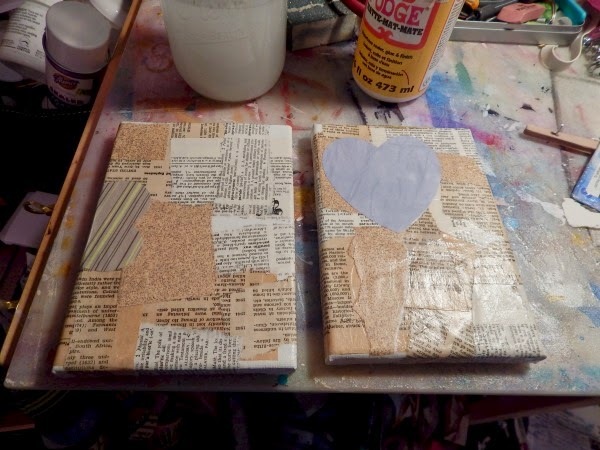 I would not have thought to make a book out of two canvases. Very kreative and interesting to look at. FUN! Beautiful Dana. I found the Shaak a couple months ago and loved seeing the way you did this kit. Would you believe I have never had a kit of any kind!!!??? Looks like fun though so one of these days I will get one and play! Your creation is just lovely in every way.Really enjoyed reading and seeing it all. j.
Dana this is gorgeous! L-O-V-E it. 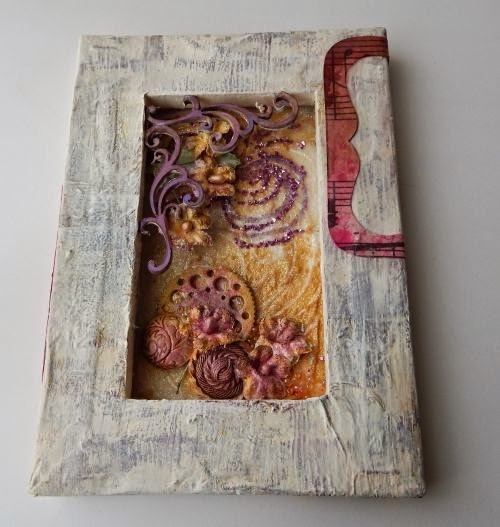 You are so very creative and talented with mixed media projects!